Arudpany Girls' Home was flooded by the 26 December tsunami, but by 29 May 2005 repairs were completed and the residents returned. 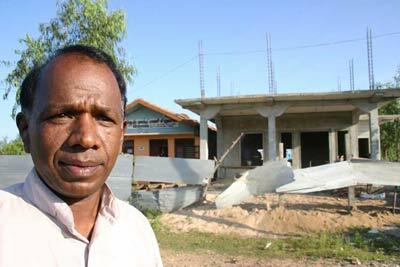 Reverend Puvanendran is rebuiding Bethel Arudpany Girls Home after the old home (center) was damaged by the Tsunami. Almost all the villages in Batticaloa District (Eastern Province) have been the victims of past disasters, both natural and man made. These disasters have left the villages five to ten years behind in their struggle for progress, prosperity and human dignity. As a result of the war the people suffered losses to life, property, wealth and health. Education too was badly affected as people were displaced from their homes, farms, places of work etc. The war left many children fatherless, motherless or orphaned. The majority of the 33 girls at Arudpany Girls' Home are fatherless; their fathers either dead or missing. In most of the ‘fathers missing' cases, the families are waiting for the death to be certified. The mothers, now widowed, are often either unable to afford their children, or re-marry. Rev. S. Puvanendran, (Anglican Inland Missionary Society, ex-missionary), is the founder and chairman of the Arudpany Girls' Home. He set up the Home in 1997, and in doing so took upon himself and the executive committee of seven the responsibility for the girls' welfare, their health, education, etc. In 2004 the Home received a meager 88,400 rupees from the Government. It has no sponsor, nor does the home receive financial assistance from any church. The 2004 Tsunami that destroyed so many villages on the east coast and killed so many directly affected Arudpany Girls' Home. By the grace of God, all the girls were saved, however much of the home was destroyed. The girls, forced to move location had, until very recently, been living in confined quarters in the church buildings. During this period the Reverend was forced to send the four workers away due to lack of funds, leaving the care of all the children to himself and his wife. Although the girls have now returned to the remains of their old home, circumstances are still far from satisfactory. Temporary showers and a temporary kitchen have been erected, but the home needs donations in order to begin proper re-building. 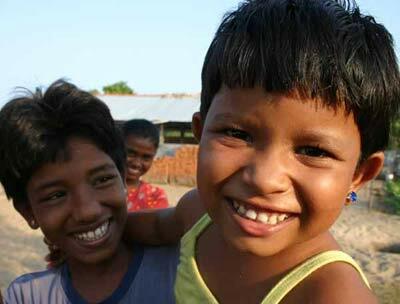 Many of the children, traumatized by the tsunami, are scared of the sea. One girl, injured from the war, is not able to run should another tsunami or natural disaster strike. Likewise the younger children are too small to run to safety. As a result, the Reverend requires sufficient funds to not only restore the original buildings but to build a second storey where the girls can sleep without fear. The girls need such basic essentials as new toilets (at present they only have one), a well, trees for shade, and a tank for drinking water. This is not to mention basic amenities such as mats and buckets, which are in short supply, boxes and cupboards, a telephone, fans etc. In the past years the Reverend has been loathe to actively seek assistance in the form of funding, trusting in God and the good will of his fellow men to provide. So we appeal to you. The estimate for the new two storey building is 8,050,000 rupees.